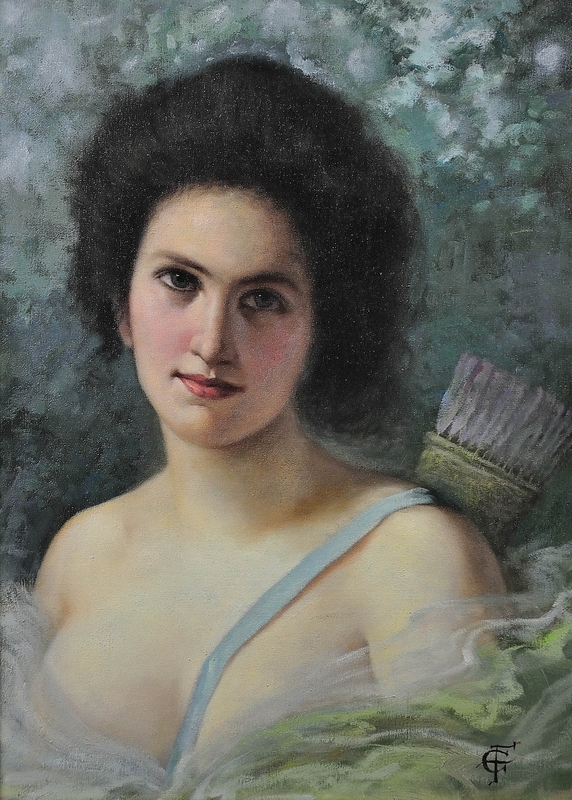 after Vittorio Matteo Corcos - Diana, the Huntress - Online gallery supplying original fine art. Trending Modern British and Contemporary Welsh. A unique opportunity to acquire a period vintage oil painting from between the Wars after Vittorio Matteo Corcos (Italian 1859- 1933) and Guillaume Seignac (1870-1924). The overall presentation and origin is very much in the Art Nouveau style. A tremendous interior decorator’s piece with a look of knowing, beauty and grandeur that transcends many styles.<br> The work is presented and supplied in an ornate frame of the same period and is glazed. <br> The painting is signed with an unidentified monogram.<br> <br> There have been many paintings and sculptures created in and after the Art Nouveau period of Diana the Huntress. This representation lends on works by Vittorio Matteo Corcos (1859-1933) and Guillaume Seignac (1870-1924) for inspiration whilst using a slightly cooler palette and softer composition.<br> <br> Diana is depicted as a young woman with a pale complexion, rosy cheeks, fine features and full red lips. She has captivating dark green eyes and her raven black hair is tied back away from her face. She gazes out with an intelligent, knowing expression. Her shoulders are bare, save for a blue sash or strap which appears to support a quiver, in which there are about a dozen arrows with pink feather tips. Her bust is just covered by her gown, a profusion of pale chiffon. The background and indeed the main palette is of soft blues and pale pinks and mauves. The overall impression is elegant, refined, and classical. This is a superb decorative piece, with the connection to a romantic period of design history and brings with it a touch of mystery. A unique opportunity to acquire a period vintage oil painting from between the Wars after Vittorio Matteo Corcos (Italian 1859- 1933) and Guillaume Seignac (1870-1924). The overall presentation and origin is very much in the Art Nouveau style. A tremendous interior decorator’s piece with a look of knowing, beauty and grandeur that transcends many styles. The work is presented and supplied in an ornate frame of the same period and is glazed. The painting is signed with an unidentified monogram. There have been many paintings and sculptures created in and after the Art Nouveau period of Diana the Huntress. This representation lends on works by Vittorio Matteo Corcos (1859-1933) and Guillaume Seignac (1870-1924) for inspiration whilst using a slightly cooler palette and softer composition. Diana is depicted as a young woman with a pale complexion, rosy cheeks, fine features and full red lips. She has captivating dark green eyes and her raven black hair is tied back away from her face. She gazes out with an intelligent, knowing expression. Her shoulders are bare, save for a blue sash or strap which appears to support a quiver, in which there are about a dozen arrows with pink feather tips. Her bust is just covered by her gown, a profusion of pale chiffon. The background and indeed the main palette is of soft blues and pale pinks and mauves. The overall impression is elegant, refined, and classical. This is a superb decorative piece, with the connection to a romantic period of design history and brings with it a touch of mystery.